We're excited to have Juleah del Rosario join us to share more about her latest novel, 500 WORDS OR LESS. Juleah, what do you hope readers will take away from 500 WORDS OR LESS? I think for some readers the verse format may be a little uncomfortable. It’s not going to provide a fully fleshed out portrait of characters and scenes in a way that is completely satisfying. I guess the way I see the world is that our lives are not novels, fully fleshed out, but instead scraps of connected experiences with a lot of white space in between. We can create fully formed narratives in our heads about our lives and what everything means, filling up the white space, but is it the truth? Is it reality? Life is filled with incompleteness, with white space, with discomfort and dissatisfaction. The verse format allows me as an author to explore this sense of incompleteness, of what I want to exist in the white space, all the things in life that go unsaid, the people and experiences we fail to fully understand. For the reader, I want more time to be spent in the white space. Where is the white space in our own lives and reality? I know that 500 Words or Less may be a quick read for some readers, but I guess I urge readers to slow down with this and any novel written in verse, and really spend time considering the white space. When I read the ending, some of the last few lines I choke up. Every time. I can open the book and flip to the last few pages and still feel the same way. I am really proud of the words I wrote, how it makes me feel and how I hope it will translate emotionally, on a raw, visceral level, for other readers. But I’m not proud of how I got there. I remember writing those words. I remember because I was supposed to be somewhere else at the time, an engagement that was time sensitive, that I was running late for, and actively disappointing someone I cared about. “I think I have an ending,” I said. For the longest time I felt that if I hadn’t blown off my friend, hadn’t shown up late again, hadn’t made that decision I made, those words would never be there at the end. Maybe they wouldn’t have. I was writing a novel. I had forgotten that it doesn’t change me from being a person, that I still need to be a living breathing human, and that I was doing a pretty crappy job at human-ness. But you never get to check out of being a human. You are always human. There is no entitlement in being one human versus another human. You are just you. No, never. Writing as novel is still hard. Really fricken hard for me. My brain does a better job at recognizing why something isn’t working, if the narrative arc is lacking, if a character is falling flat, but it does not tell me at all how to fix it. But I’ll go back to my craft books and resources, I’m a huge fan of Lisa Cron’s books, and try to look at my work from a new angle. For a long time I thought the ultimate goal that all writers, including myself, wanted was to quit their jobs and become a full-time author. What could be better than writing? But then I fell in love with something else, my day job. I get so much personal fulfillment out of the work that I do and the people I connect with. Yes, it’s still a job that you have to go to everyday, and sometimes there’s some office drama, but I really like what I do. I’m here to give other writers the permission to love, keep, and continue to flourish in their day jobs. You don’t have to be one thing. Time is definitely a challenge. Time to write, time to have meaningful relationships with friends and family. Time to have fun. Time to work. But just like you wouldn’t dream of quitting writing, why quit something that you love? 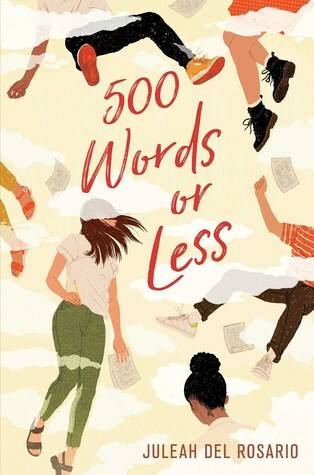 Have you had a chance to read 500 WORDS OR LESS yet? How do you look at your work from a new angle? Do you love your day job or do you want to write full time? Share your thoughts about the interview in the comments!